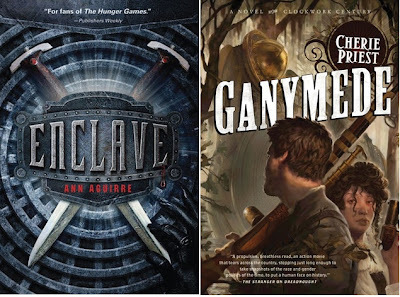 In honor of Zombie week, you have the chance to win Enclave by Ann Aguirre or Ganymede by Cherie Priest. Enclave is the first entry in a YA dystopian series and while it might not have zombies, it does have ravenous monsters who want to eat you alive. 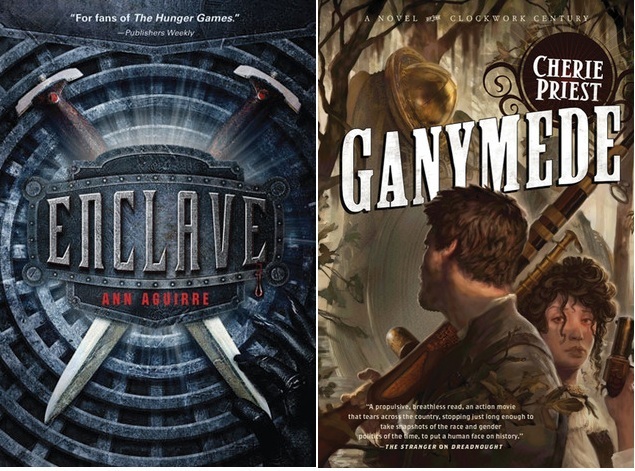 Ganymede is the 4th book in Priest's Clockwork Century series. Set in New Orleans there are zombies, airships, and a submarine. Both series have new books coming out this fall. Entering is easy: send us an email at info at stellar four dot com titled ZOMBIE GIVEAWAY and let us know which social media you follow us on with a link to your account. We'll announce the winner next Thursday, July 26. The winner gets to choose Enclave or Ganymede. This contest is international, so everybody get those entries in!